San Francisco, CA (January 19, 2018) – Tonight in San Francisco, the Good Food Awards named Catoctin Creek Roundstone Rye a winner in spirits category of the 2018 Good Food Awards. Over 1000 people gathered to pay tribute to all Good Food Award Winners of 2018. Seated by the majestic Golden Gate Bridge on the San Francisco Bay, numerous farmers, makers, chefs, journalists, and activists united to celebrate the exceptional artisan food craft including luminaries Alice Waters, Nell Newman and Slow Food Founder, Carlo Petrini, who presented the awards. Accepting the award for Catoctin Creek was Assistant General Manager, Lauren Barrett. "We are thrilled to once again be receiving recognition for our flagship Roundstone Rye whisky," said Ms. Barrett. "There's no other award quite like the Good Food Awards medal. We don't just win on taste, but also on the sustainability of our production practices." 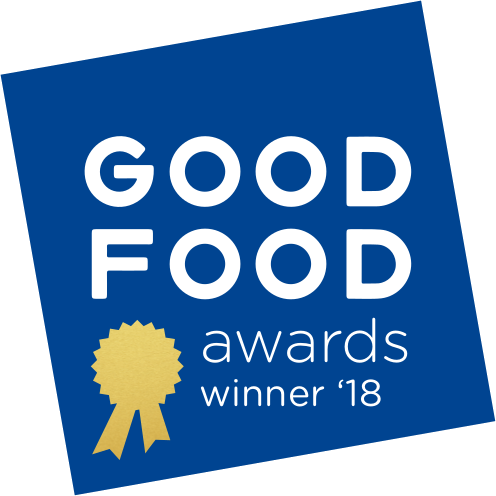 The full list of 2018 Good Food Award winners can be found here. About Catoctin Creek Distilling Company: Catoctin Creek Distilling Company (120 West Main Street, Purcellville, VA 20132; Twitter: @catoctincreek) is the first distillery in Loudoun County Virginia since before prohibition. Family owned and operated, Catoctin Creek produces premium spirits: rye whisky and gin from organic sources, and brandy from Virginia wines. For media-related inquiries, please contact Hannah Watson at hannah@mtnhighmedia.com or 434-964-0004 ext. 19, or for more information please visit www.catoctincreek.com. © Copyright 2017, Catoctin Creek Distilling Company, LLC. All Rights Reserved.